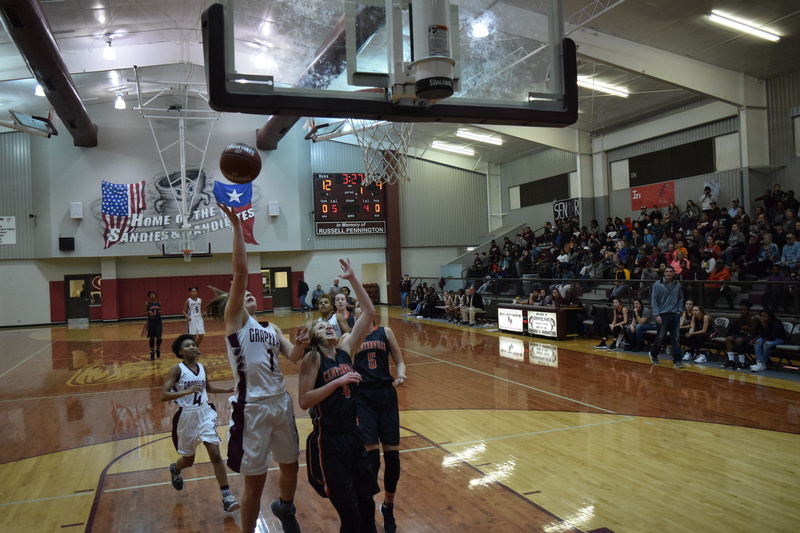 GRAPELAND – What was billed as a showdown between two ranked teams, turned into a blowout as the Grapeland Sandiettes defeated the Centerville Lady Tigers, last Friday night, by a final score of 57-33. The Sandiettes game plan was simple – make shots and outwork the Lady Tigers – and they executed it to perfection in the first quarter. .
Grapeland came into the game ranked #11 in the state while Centerville was ranked #25. The Sandiettes caught the Lady Tigers flat-footed and smacked them right in the mouth during the first eight minutes of play. The Sandiettes poured in 30 points in the first quarter while holding the Lady Tigers to five points. After the Grapeland point barrage, Centerville was forced to try and play catch-up for the remainder of the game but the Sandiettes were too strong and coasted to the 57-33 win. The three-ball was the key to the Sandiettes success in the first quarter as they hit a combined six three-pointers. Hannah Chipman knocked down three from behind the arc, while Ragan Bowie had two and Keke Harris had one. Teira Jones had eight points from the post while Tatiyanna Bowie and Kenya Woods both chipped in two from the field. The Lady Tigers points came from Raylynn Brewer and Sara Stutzman with two apiece. In addition, Averi Hancock converted one of two from the free throw line to end the first quarter scoring. While the second quarter saw the Lady Tigers point production increase, Centerville’s defense could not contain the Sandiettes’ offense. Bowie paced Grapeland in the period with six points while Chipman and Jones both had two. Harris hit one of two from the charity stripe to close out the half with the Sandiettes comfortably ahead by a score of 41-14. Centerville’s second quarter points came from Brewer with seven and Stutzman with two. After the break, Grapeland began to slow things down in an attempt to run some time of the clock. Jones dropped in four for Grapeland as Chipman and Harris both had two. 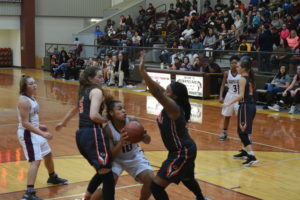 The Lady Tigers points came from Brewer with five as both Tara Goolsby and Stutzman had two to bring the third quarter to a close with the score 49-23. Once the fourth quarter got underway, Centerville attempted to make a comeback but the lead was too great as the Sandiettes held off the Lady Tigers by a final score of 57-33. Grapeland’s points in the fourth quarter came from Jones with eight and T. Bowie for two. Centerville was paced by Brewer and Brittany West with four, while Brooke Denman chipped in two. For the game, Grapeland’s Teira Jones led all scorers with 20 points. Hannah Chipman netted 13 for the Sandiettes while Tatiyanna Bowie had 10. Ragan Bowie and KeKe Harris both had six while Kenya Woods had two to close out the Sandiette scoring. The Lady Tigers were led by Raylynn Brewer with 18 points. Sara Stutzman had six, Brittany West had four, both Brooke Denman and Tara Goolsby had two and Averi Hancock chipped in one.